This isn't a regular ol comedy show; this is an interactive audience participation show; comedy audiences don't get permission to "HECKLE THE COMICS" very often; don't miss this once in a lifetime show. comedy audiences don't get permission to "HECKLE THE COMICS" very often; don't miss this once in a lifetime show. READ THE FOLLOWING RULES CAREFULLY AS THEY WILL BE ENFORCED WITHOUT EXCEPTION. Tickets can be available for pick-up in the Business Office days prior to the event, or at the door as you enter your show. Business office is open Tuesday, Wednesday,Thursday , Friday 10am to 5pm, and Saturday 11am to 5pm. "Late show" purchasers will visit the a "will call" window before you get in line to enter the show. TICKET PURCHASER MUST HAVE MATCHING CREDIT CARD USED AND ID. TICKET PURCHASER MUST PRESENT THE CREDIT CARD USED FOR PURCHASE AND ID. *A valid government-issued photo ID and the CREDIT CARD used to purchase tickets are BOTH REQUIRED to pick up tickets at the box office window. *Will call tickets must be picked up by the card holder ONLY. Alternate names for will call will not be allowed. All orders that do not have matching CREDIT CARD & ID will be deleted. *All reserved/VIP seats are held ONLY UNTIL SHOWTIME. After showtime your reserved seats are NOT GUARANTEED. Purchase ALL VIP tickets for your party in ONE transaction and your party will be sat as a group. . (925) 227-1800. *PLEASE NOTE: There is a (2) item minimum PER PERSON (which can be any combination of food and/or drink). AGAIN, the above rules will be enforced WITHOUT EXCEPTION. Help the San Leandro P.D and the San Leandro Police Association raise funds for the local chapters helping to shine the light on Autism this month. ALL proceeds will go direct to the Association...Please save the date for this great cause. Dave is seen on local stages all over California. Come on down and catch him as he presents a Clean Show with some talented friends. 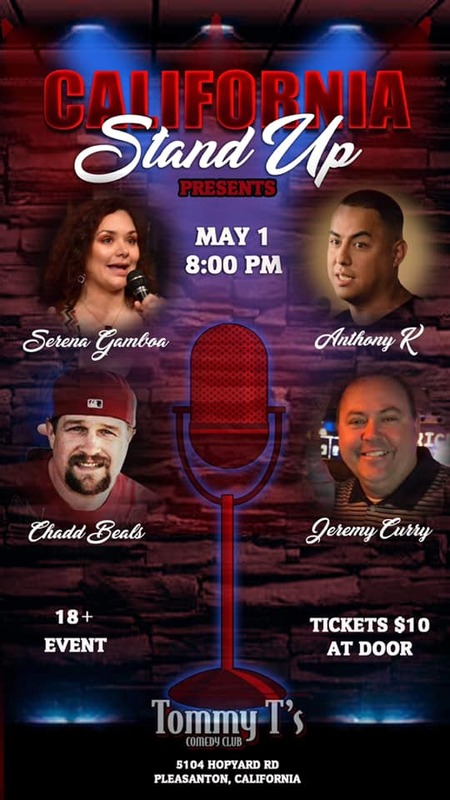 A night of laughter to honor Sergeant Mike Dunn and help with his rehab from a cycling accident. Featuring: Sam Marcoux, Headliner, Dennis Gaxiola. Just for the Record, which documents a live performance by the comedian, was released in 2011. In 2004 Comedy Central ranked him at #74 on its list of the "100 Greatest Standups of all Time. "Rodriguez was acknowledged with the "Humanitarian of the Year Award" by the City of Fresno for his work in the area of water conservation. Who are newest and funniest in the bay..You Decide! Sign Ups start @ 6:00, must have your name in by 7pm. Another great "Long Shoreman Show"
Wayne Colley, better known as “Kountry Wayne,” is not your average standup comedian. If you asked him to describe himself, he would say he is just a reserved vegan and father of eight who wants what’s best for his kids. Hailing from Millen, Georgia, Wayne grew up with aspirations of becoming a super-star rapper, however those ambitions quickly changed when he posted a video to Facebook and became a viral sensation overnight. Wayne attacked his new found fame head on and grew his audience to over 4 Million followers across Facebook & Instagram by delivering amazing content on a daily basis. Never willing to say no to a fan, Wayne heeded their calls when asked to perform standup comedy. He initially started performing in small clubs in Atlanta and by 2016 had embarked on a 45 city sold out tour (2016 Child Support Tour). Since then Wayne has consistently performed year-round, regularly selling out clubs & theaters across the country to a diverse, wide-reaching audience with his unique brand of high energy, faith based, and clean content. Wayne still resides in South Georgia where he runs two successful business in addition to his presence online and on the road. With his humble roots and unbridled energy it’s clear Wayne will be making people laugh for years to come. This week Come out and see our great mid week line up!!.. Catch a rising star, or two, tonight!!! HUNKS, " GIRLS NIGHT OUT"
Along with being professional dancers, the men of HUNKS the Show are also models for huge houses like Calvin Klein and Abercrombie & Fitch, body builders who have appeared in Muscle & Fitness Magazine, and television personalities who can be seen on reality TV and VH1. During the performance, you’ll get up close and personal with the boys as they walk through the audience, and if you’re sitting in the on-stage seating or the hot seat, you can expect some fiery personal attention from the hot male dancers of HUNKS. And don’t forget to get acquainted with the guys through their online profiles before the show! Get in on the action as hometown Road Comics come back to ROOST! Mario is our "Go TOO" comic for all things funny. Mario produces monthly shows that have included top comics and short film previews. American actress and comedian who has starred in television series such as The Parkers and Moesha and was one of the stars on The Queens of Comedy tour. NO REASON TO LEAVE TOWN FOR THE FOURTH WHEN YOU CAN STAY HERE AND ENJOY THE FUNNIEST COMEDIAN AROUND!